Expectations are desired outcomes. We desire something and when it doesn't happen we are disappointed. We experience contradiction. This is because we view the world out there as something we can control but the truth is we can’t; we can only control our responses. Yes, we can influence some things and maybe manipulate other things but that can lead to trouble because you develop the feeling that you can control most things. But it’s the things that happen that we can’t control that cause us to be emotionally upset or angry. In the physical sense we have a bit of chemistry to overcome. Our brain releases dopamine when it is pleased. So when its expectations are met and our brain is pleased a small amount of Dopamine is released into our system. This gives us a quick feeling of pleasure and well-being. Larger amounts of Dopamine are released if you exceed your expectations. This “reward” for meeting our expectations can result from the smallest form of having your expectations met. For example, being on a deadline and looking up and seeing you have 30 minutes more than you thought you had or having the light turn green just as your reach the intersection. Both of these events cause Dopamine to be released. Conversely, when you have an expectation that is not met, you not only don’t have the flush of Dopamine, you actually have a more negative feelings come up. This can even dip you below where you would be normally. In some instances you might even have a momentary feeling of fear. Having expectations is the real source of all unhappiness. You looked forward to a clear warm day and it rains. You have an appointment and your car won’t start. You were hoping to get the new job and you didn't. For example when your expectation is a sunny day but you get wind and rain, look at the weather and accept that this planet has a lot of weather and without it the entire planet would be a desert. So you accept the weather and put on a raincoat or pick up an umbrella. So try stepping back from the emotional engagement of contradicted expectations. 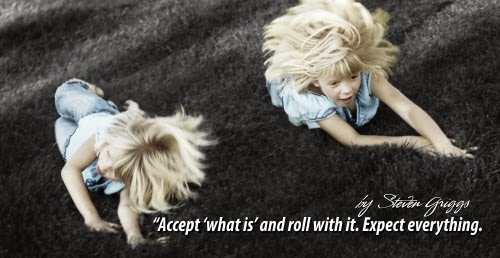 Accept “what is” and roll with it. Expect everything.